After a second-place finish in 1906, manager "Pongo Joe" Cantillon was hired away from Athletic Park by the Washington Nationals. In his place, the Brews tapped the Irish-born "Dirty Jack" Doyle as field general. This page from the "Illustrated Sunday Section" of Milwaukee Sentinel was published on May 5, 1907. It intoroduces Milwaukee baseball fans to their new skipper and his charges. The 1907 season was disastrous; after two consecutive second-place finishes, the Brewers finished 71-83 and in 7th place, with only St. Paul between them and the cellar. George Havenor, pictured at top left, had been the owner of Milwaukee's entry in the American Association since its inception in late 1901, and ran the club until his death in April 1912, when his shares passed into the hands of his wife. That's a beautiful block "Milwaukee" on those uniforms, as much of it as we can see – love to find a better view. Just a fabulous piece. I didn't realize Leo Sage was on this team. And I wonder who the fellow named "Cumiskey" is, perhaps it is Ignatius Comiskey, but I know nothing about him. 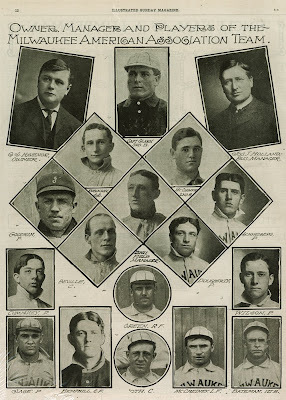 There may be one or two other pictured here that are not in the roster book I assembled, so this page from the past is going to help me tighten the loose threads of Brewers history just a bit more. Who owns this gorgeous piece?